Q: It is reported that Japanese Prime Minister Shinzo Abe expressed a strong will to improve relations with China in his new year speech delivered in Tokyo on January 5. Yoshihide Suga, Japanese Chief Cabinet Secretary, also said in an interview that as Japan-China ties improve gradually, the year 2018 presents the best opportunity. He hopes that mutual trust could be enhanced through stronger economic ties and people-to-people exchanges. What is China's response to these positive remarks on China-Japan relations? A: We have noted these positive remarks made by Japanese leaders and senior officials. 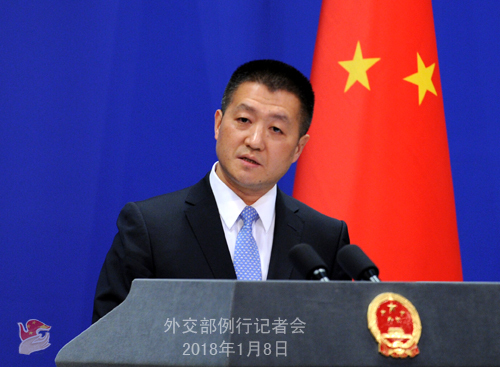 In the new year, we hope that Japan could work with China, strictly abide by the four political documents between the two sides and the four-point principled agreement, and seize the opportunity presented by the 40th anniversary of the signing of the China-Japan Peace and Friendship Treaty to create favorable conditions for all-around exchanges and cooperation and work for the improvement and development of China-Japan relations. Q: I was wondering if you could give us any more updates on the oil tanker situation off the coast of the East China Sea and the search and rescue efforts? Any more information about people rescued? A: My colleague already made a response to the accident over the weekend, as you may have all noticed. China's Transportation Ministry has also released relevant information. The latest development is that at 10:30 this morning, the body of one crew member, whose identity is still pending verification, was found at the scene by the Chinese side. The Chinese government attaches high importance to this maritime disaster, and has dispatched many vessels to assist in the search and rescue efforts. Despite the harsh sea conditions and poor weather, the Chinese government is going all out to carry out search and rescue work. Some of the crew were rescued, but many remain missing. The Chinese side has also sent specialized cleaning vessels to prevent secondary disasters. The cause of this disaster is still under investigation. We appreciate the assistance offered by the relevant countries. We will keep you updated. Q: Do you have information about how compensation agreements might be reached? What sort of processes is to be gone through in order to work out who is compensated and how? A: As I just said, the cause of the accident is still being investigated. You can only move on to the issue of compensation after the cause of the accident is established. What is imperative at the moment is stepping up efforts for search and rescue, which is exactly what the Chinese government has been doing since the accident happened. At the same time, no time should be wasted in carrying out the cleansing work. Q: According to the UNSC Resolution 2375 and the requirements previously set out by the Chinese government, all DPRK companies in China, either joint ventures or sole investments, must close by January 9. How will China enforce this decision? A: In the notice put up by China's Commerce Ministry and the State Administration for Industry and Commerce on September 28, 2017, stipulations are made on the closure of the DPRK businesses under the UNSC Resolution 2375. As a permanent member of the Security Council, China always strictly implements the Security Council resolutions and fulfills its due responsibilities. You may take another close look at the notice. Q: Yesterday, a White House official said China could play a role in convincing Pakistan for dismantling terrorist safe havens. And he also said Washington is seeking to work with Beijing and other regional players to prevail on Islamabad to act on whatever President Trump prompts most recently. China has been defending Pakistan in recent weeks. In light of this, will China be cooperating with America to convince Pakistan to crack down on terrorists in Pakistan? A: Terrorism is a common enemy for all mankind, and fighting against it needs the collective efforts of the international community. China consistently opposes linking terrorism with any specific country, nor approves shifting the whole responsibility onto one specific country. We have said many times that Pakistan has made important contributions as well as enormous sacrifices to the fight against terrorism. Pakistan deserves full acknowledgement from the international community on its counter-terrorism efforts. All countries shall enhance counter-terrorism cooperation and benefit from synergy while bearing in mind mutual respect and equality, rather than hurling accusations and pressurizing upon each other which works against the international community cooperating effectively against terrorism. You said that China has been defending Pakistan. The thing is we are rightfully defending all countries that are doing their bit against terrorism, not just Pakistan. You also asked whether we would cooperate with the US. Like I said, China supports and actively participates in the international counter-terrorism cooperation that is built on mutual respect and equality. Q: First, French President Macron is in China. What is China's outlook for the China-France relations? Second, the ROK and the DPRK are about to hold a high-level meeting. What is China's comment? A: On your first question, President Macron is now on his tour in Xi'an. He will arrive in Beijing this afternoon, which is the most important leg of his state visit upon invitation of President Xi Jinping. As for our take on how China-France relations will develop through President Macron's visit, France was the first major country in the west to establish ambassadorial diplomatic ties with the new China. That important historic decision made by Chairman Mao Zedong and General Charles de Gaulle was truly a visionary one. History has proven that the establishment of diplomatic ties between China and France has played an important role in making international relations more sound and democratic. Overall, China-France relations have been growing smoothly since the establishment of diplomatic ties. In recent years, the China-France Comprehensive Strategic Partnership has been developing at a high standard and in a sound and steady way, with all-around cooperation yielding one outcome after another. President Macron is the first foreign head of state China receives in the year 2018, and also the first head of state of a EU member state to visit China after China's 19th CPC Congress. This is also President Macron's first state visit to China after assuming office. We believe that this visit is significant for the China-France and China-Europe relations in the new era. The Chinese leaders are also looking forward to having an in-depth exchange of views with President Macron on the next steps to move forward China-France relations in the new era as well as international and regional issues of mutual concern. We believe that this visit will serve to deepen mutual understanding and friendship between the two heads of state, enhance political mutual trust and strategic communication between two sides, and further boost bilateral relations and all-around practical cooperation so as to bring more tangible benefits to the two peoples and contribute to the development of China-Europe ties. Regarding your second question, we've all been following the recent positive evolvement of the Korean Peninsula situation. We keep reiterating our position for quite some time. As a close neighbor to the Peninsula, China welcomes and supports these positive moves made by the DPRK and the ROK towards easing their bilateral relations. We also hope that all relevant parties of the international community could lend their support to sustain such positive momentum and work together to find a good way to ease tension, enhance mutual trust, and resume dialogue and consultation. China has been working tirelessly and making positive and constructive efforts for the settlement of the Korean Peninsula issue. Keeping a close eye on the Korean Peninsula situation, we will continue with our efforts to promote peace talks. Q: There've been reports that President Macron has brought a horse as a gift to China. Can you confirm it? A: President Macron just arrived at Xi'an this morning where he kicked off his visit in China. He will arrive in Beijing this afternoon, which is the most important leg of his state visit. President Macron's visit to China upon invitation of President Xi Jinping is a significant one. The two sides all attach great importance to it. Our two teams have been working closely together for the same goal, which is to ensure the success of this visit, a visit we believe will further elevate China-France ties. Your information is correct. President Macron gave a horse to President Xi Jinping as a state gift. We really appreciate this friendly gesture. Q: Some DPRK companies may continue with their operations in China through equity transfer or other means. How can China make sure that such things will not happen? A: First, all the DPRK-related resolutions adopted by the UN Security Council and the sanctions mechanisms set up by it were built upon thorough discussions among the Security Council members, with relatively detailed stipulations. The purpose of these stipulations is to ensure that the sanctions mechanisms get implemented effectively. Second, like I said before, as a permanent member of the UN Security Council, China has been strictly implementing all resolutions adopted by the Security Council, including the one you mentioned. And we also have in place a set of functional mechanisms and practices to ensure that relevant resolutions are carried out effectively. Third, as is the case with all other countries, if some loopholes in the export control or in the execution of domestic laws and regulations are proven with solid facts to exist, China will strictly deal with them in accordance with law. 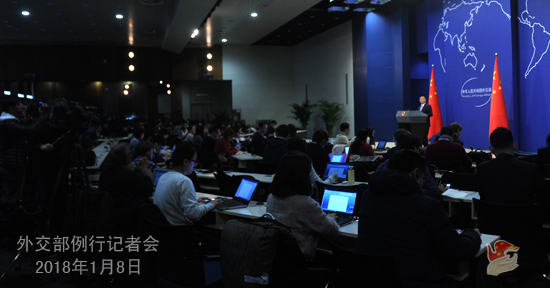 This morning, we officially unveiled the WeChat official account of the Foreign Ministry Spokesperson's Office. Many friends sent their congratulations through the WeChat platform the minute they became followers of our account. We want to thank them for their support. We already put up the account's QR code at the entrance of the Blue Room, and if you are interested, you can scan it and become a follower. We look forward to seeing you in our WeChat family. 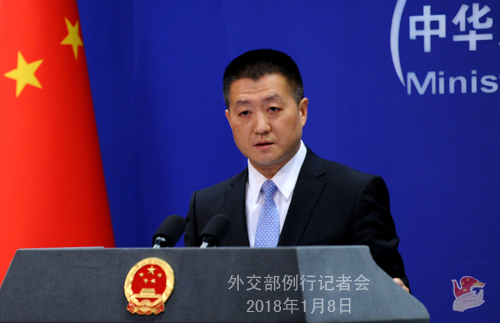 We will update to the WeChat official account the latest remarks and statements from the Foreign Ministry's Spokespersons on major diplomatic events and foreign policies. As Foreign Minister Wang Yi said in his congratulatory message, this WeChat official account serves as a window, enabling people at home and abroad who care about China's diplomacy to keep tabs on China's interactions with the rest of the world and keep informed of the latest development in China's diplomacy. We will do our best to make the WeChat official account a characteristic and efficient one so as to garner more understanding and support for the major-country diplomacy with Chinese characteristics in the new era. Due to scheduling reasons, tomorrow's regular press conference (January 9) will start earlier at 14:30 p.m. at the same venue.